Jeff Cohen, chief counsel for the Association of Public-Safety Officials (APCO), speaks about the issue of 911 call location accuracy and APCO's role in improving the issue at APCO's Emerging Technology Forum in Atlanta. 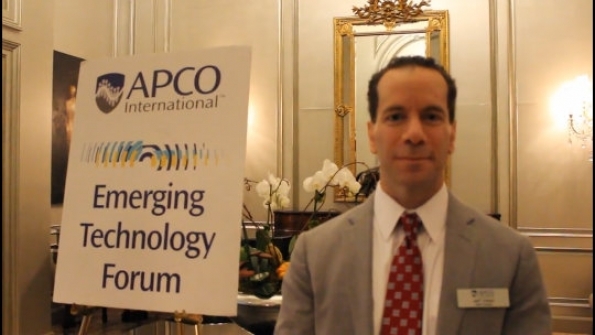 Jeff Cohen, chief counsel for the Association of Public-Safety Communications Officials (APCO), speaks about the issue of 911 call location accuracy during this conversation with IWCE‘s Urgent Communications Associate Editor Stephanie Toone at last week’s APCO Emerging Technology Forum in Atlanta. APCO, NENA and the wireless industry have submitted a roadmap for dispatchable locations to the FCC that will address some of the location accuracy issues with wireless 911 calls. One aspect of the roadmap is creating the National Emergency Address Database (NEAD), which will gather unique-identifiers for wireless calls to assist with 911 indoor location accuracy.